Heat oven to 325°F. In medium bowl, mix crust ingredients; reserve 1 tablespoon crumbs for garnish. Press remaining crumbs in bottom and 2 inches up side of ungreased 10-inch springform pan. Refrigerate. In large bowl, beat cream cheese and sugar until smooth. Beat in 1 egg at a time until well blended. Add melted chocolate; beat well. Add remaining filling ingredients; beat until smooth. Pour into crust-lined pan. Bake 55 to 65 minutes or until edges are set; center of cheesecake will be soft. (To minimize cracking, place shallow pan half full of hot water on lower oven rack during baking.) Cool in pan 5 minutes. Carefully remove side of pan. Cool completely, about 2 hours. Garnish with reserved crumbs. Refrigerate at least 4 hours or overnight. Store in refrigerator. 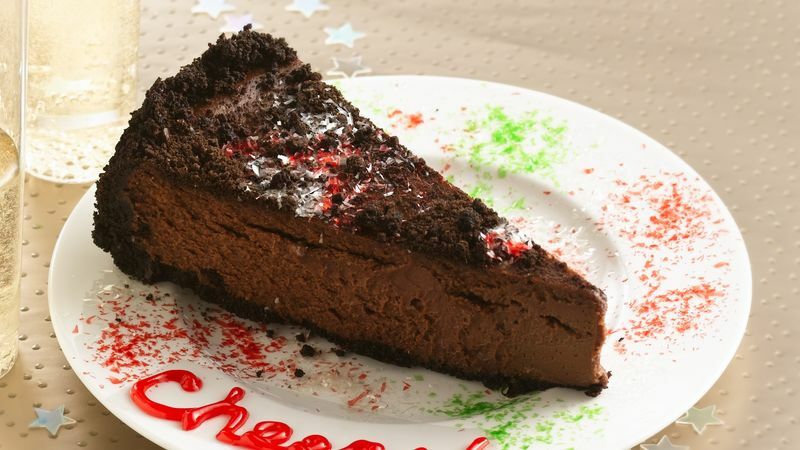 Chocolate and cheesecake--can't go wrong with that! Don't worry about the center of the cheesecake being soft when you take it out of the oven; it becomes firm as it cools. To cut cheesecake easily, dip the knife into water and clean it off after every cut.